Peanutty Ice Cream 'N Cookies - No Machine Required! 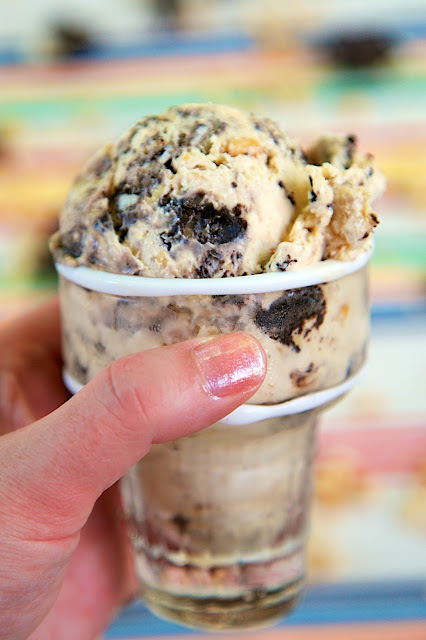 - peanut butter ice cream with double stuf Oreos and chopped peanuts - SO good! Takes 5 minutes to whip together. Throw in the freezer and you have ice cream in a few hours! Is it hot where you live? I feel like we are living on the sun down here where I live! It is so hot and the humidity is the worst! We were in need of a cool treat to cool down this week. Ice cream was in order!! This Peanutty Ice Cream 'N Cookies really hit the spot! The best part about this ice cream? No ice cream machine required! Woo Hoo! The ice cream is ready to eat in about 6 hours. This Peanutty Ice Cream 'N Cookies was SO good! 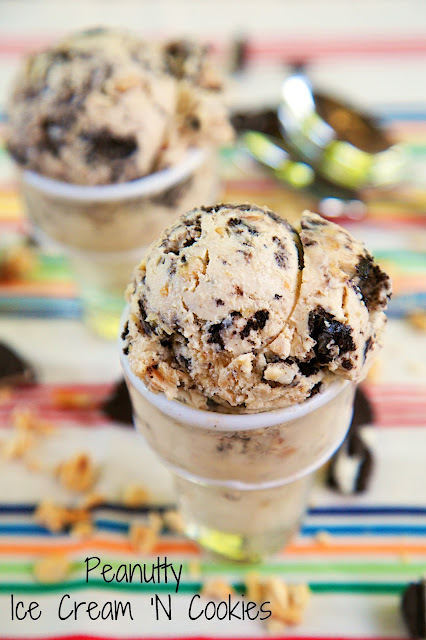 It is a quick peanut butter ice cream with chopped peanuts and Oreos folded in. All of my favorites! I used Double Stuf Oreos in the ice cream. I really feel like the Double Stuf Oreos should just be the standard Oreo. There just isn't enough stuf in the regular Oreos! Maybe we should start a petition. ;-) Until we get that resolved, make this Peanutty Ice Cream 'N Cookies and enjoy! Beat heavy cream in medium bowl with electric mixer on medium-high speed until stiff. In separate large bowl, whisk together sweetened condensed milk, peanut butter and vanilla. Fold in whipped cream, crushed cookies and peanuts. Pour into 2-quart freezer-safe container. Place plastic wrap on directly on top of ice cream mixture and cover with lid or foil; freeze 6 hours or until firm. So glad I found your site- I cooked the chicken roll ups for dinner last night and they were loved by everyone! I've also bookmarked quite a number of your recipes for later use. Thanks a bunch! That "cone" is awesome! I definitely need to try the ice cream!